We recommend visiting from 8am until 8pm, after that time we lock our doors as most residents are asleep. We welcome visitors 24 hours a day. If you would like to visit outside of the recommended hours please call in advance to ensure access. What role does Social Services play at Villa Las Palmas? Our social service team assists both residents and their families during transitional periods. They also provide essential information, manage requests and concerns, help in care, and manage discharge planning for each resident. They can arrange professional services for: Dental, Vision, Podiatry, Audiology, Power of Attorney, Dementia assessment, Psychosocial and Psychiatric Evaluation, and Individual therapy. Should you wish to have Villa Las Palmas wash your laundry, please notify the front office upon admission. Subsequently, if a family/care giver is going to take care of the laundry at home, please let the nursing station know your plans. This way, the staff can place a sign on the closet door notifying our housekeeping staff to leave the clothing for family pick up. We request that family provide a hamper for clothes and pick it up twice a week. Yes, we have a beautician that comes every Tuesday at 9am. Under MediCal, residents receive free haircuts every six weeks. All of the rooms currently feature flat screen televisions with cable. All of the rooms offer telephones. 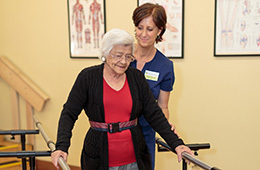 Villa Las Palmas Healthcare Center has a vibrant atmosphere with dynamic, individualized activities that match the capabilities and needs of residents and their guests. We also have active resident and family councils and volunteer programs. Scheduled activities include: music, fitness activities, religious meetings, outside entertainment, games, gardening, field trips/outings and volunteer involvement. If you would like to arrange something special or have suggestions and ideas for individual or group activities, please inform our activities director. We welcome and encourage involvement from family and friends.